A delightfully dark English mystery, featuring precocious young sleuth Flavia de Luce and her eccentric family. The summer of 1950 hasn't offered up anything out of the ordinary for eleven-year-old Flavia de Luce: bicycle explorations around the village, keeping tabs on her neighbours, relentless battles with her older sisters, Ophelia and Daphne, and brewing up poisonous concoctions while plotting revenge in their home's abandoned Victorian chemistry lab, which Flavia has claimed for her own. But then a series of mysterious events gets Flavia's attention: A dead bird is found on the doormat, a postage stamp bizarrely pinned to its beak. A mysterious late-night visitor argues with her aloof father, Colonel de Luce, behind closed doors. And in the early morning Flavia finds a red-headed stranger lying in the cucumber patch and watches him take his dying breath. For Flavia, the summer begins in earnest when murder comes to Buckshaw: "I wish I could say I was afraid, but I wasn't. Quite the contrary. This was by far the most interesting thing that had ever happened to me in my entire life." Did the stranger die of poisoning? There was a piece missing from Mrs. Mullet's custard pie, and none of the de Luces would have dared to eat the awful thing. Or could he have been killed by the family's loyal handyman, Dogger... or by the Colonel himself? At that moment, Flavia commits herself to solving the crime -- even if it means keeping information from the village police, in order to protect her family. But then her father confesses to the crime, for the same reason, and it's up to Flavia to free him of suspicion. Only she has the ingenuity to follow the clues that reveal the victim's identity, and a conspiracy that reaches back into the de Luces' murky past. 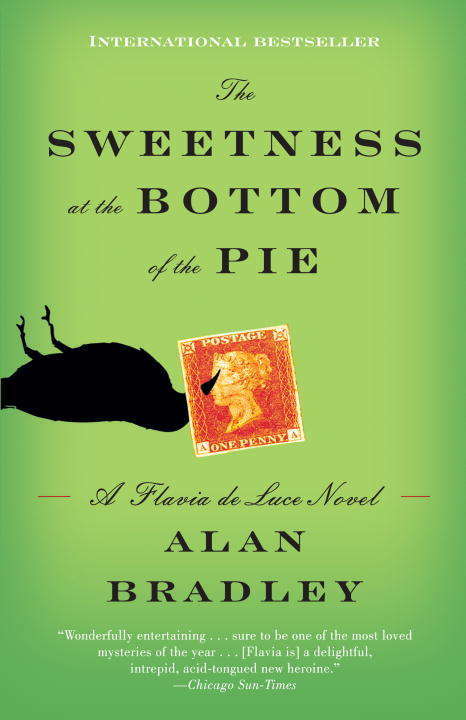 A thoroughly entertaining romp of a novel, The Sweetness at the Bottom of the Pie is inventive and quick-witted, with tongue-in-cheek humour that transcends the macabre seriousness of its subject. Winner of the 2007 Crime Writers' Association Debut Dagger.